Luxury British sports car marque, Aston Martin, has extended its brand influence with a new performance power boat. 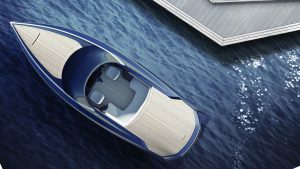 The 37-foot craft sporting the Aston Martin name is built to the same exacting standards as the company’s celebrated cars. Owners can even choose to have their AM37 craft built to match the colour of their Aston Martin car, albeit with paint manufactured to marine-grade specifications for quality and durability. Among the many luxuries you would naturally expect from this high-profile brand is an innovative refrigerator on board the AM37 to keep beers and wines at the perfect temperature. But with these sea-going craft capable of making 50 knots (over 56mph), the physical security of the owner’s stock of liquid refreshment is equally important. That’s why Aston Martin’s boat builder, Quintessence Yachts of Southampton, turned to the marine and vehicle refrigeration specialists at Havant-based Penguin. In turn, Penguin partnered with electromagnetic actuator experts Magnet Schultz Ltd to develop bespoke electric fridge locking mechanisms to meet some very special design criteria. The entire concept of Aston Martin’s boat is different. So the fittings need to be different, and of exemplary quality. Upon approaching Penguin, bespoke boat builders Quintessence Yachts presented Penguin managing director Ian Gorringe with a simple void. “It was a hole in the galley fittings ready to be filled by a refrigerator capable of withstanding the inevitable pounding of the craft’s hull over the water,” Gorringe explains. “It was a blank canvas. And we needed to come up with a refrigeration solution that was worthy of the calibre of these new craft: visually and functionally attractive, yet tough enough to withstand conditions at sea. It’s easy to underestimate the exaggerated scale of vibrations at fifty knots,” he adds. Rather than a conventional fridge with a door, Gorringe and his team conceived an elegant unit based on a pair of slide-out refrigerated drawers. This gave the unit a contemporary edge, lending itself to styling without a handle that suits the impressive craft interior, and simplified the way in which bottles and tins are held securely within. In addition, the unit was to be remotely lockable without the need for human intervention when the craft is underway. That goal to simplify the operation of the new fridge created a challenge for the locking mechanism design. A further challenge came from the graceful ‘soft-open’ mode envisaged by Penguin: this smart press-button function opens the drawer by 50mm. In this ‘first release’ position, the drawer will open no further if the craft is moving. Informed by the outcome of the initial test prototype, MSL engineers set about refining the design to make the lock more robust and capable of surviving the harsh conditions. 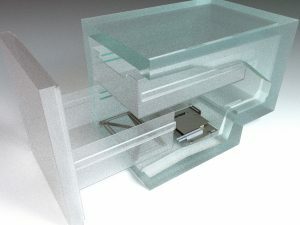 The final development phase benefited from the sea test result as well as clearly identified requirements for some features, including those designed to add a bit of cool: “The soft-open function added an extra dimension to our development challenge, but is an impressive and elegant feature,” Newton explains. In addition, aspects of the final application dictated certain product characteristics: marine-grade construction was imperative as was resistance to chemical clean down. The lock needed to be suitable for different sized drawers. And the electric push-button operation needed a manual override in case of power failure. The project was successful. The first two production lock units were delivered and fitted to Penguin fridges in AM37 power boats. These craft are now in the hands of their owners. To date, there are no reports of issues, concerns or failures of the impressive drawer fridge, its electric lock, or its rather cool soft-open function – a blue LED array illuminates the fridge contents as the button is pressed. So the preservation of beers and wines at sea, and at speed, seems comfortably assured, thanks to a unique collaboration between two specialist British engineering companies.